There's quite a bit of this going on in Europe: various international musicians gathering to create a new band or simply a one-off project around shared musical interest. Laneslide is another one, created by Italian songwriter, guitarist, producer Bruno Kraler (Brunorock). Flying High boasts some very big talent in the AOR melodic rock field including vocalist Frank Vestry (Marcello/Vestry), keyboardist Alessandro Del Vecchio (Hardline, Lionville, Edge of Forever), bassist John Billings (Rick Springfield, Donna Summer, Lancia), and drummer Dominik H�lshorst (ex-Bonfire). With Flying High you get what you expect. This is well-crafted and well-played melodic rock from some quite talented musicians. Laneslide make no attempt to reinvent the AOR wheel. Big melodies are followed by big hooks in arrangements and lyrics, bright keyboards, and snappy guitar solos. Several best examples include the motivational You Can Make It, the severely addictive Dancing Girls, and the title cut, though this runs too long with too many chorus repetitions. Laneslide can get a somewhat grittier, even bluesier, on River of Love and heavier on Your Fight. Surprisingly, for an AOR album, there's only one ballad, the closing piece, Washed Away. Flying High is solid and entertaining AOR melodic rock. Simple. Recommended. 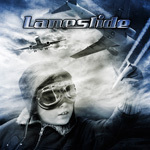 Boasting an international cast of talented musicians, Laneslide's Flying High is solid and entertaining AOR melodic rock. Simple.